Clear Breeze facilitates trust between public constituents and local officials and allows for informed decision making through our simple and responsive graphical tools. On average, people remember 10% of what they hear, 20% of what they read, and 80% of what they see and do. Expressing your data through interactive visuals ensures retention and readability. Get rid of your static PDFs and opt for a more modern approach. Allow your constituents to interact, navigate, and drill-down on all the data you wish to share. Expand on the spirit of the open government initiative by cultivating public discourse and utilizing visualized data. 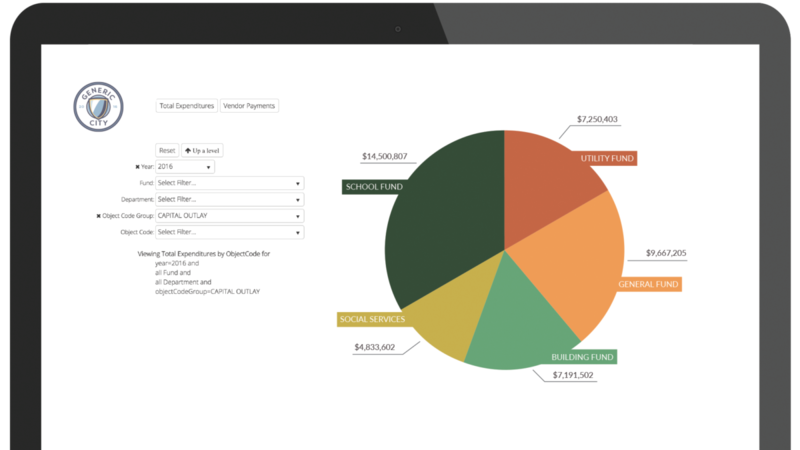 Let your staff and constituents access your data whenever they want, wherever they want with web-based dashboards. Enabling the public to view financial and checkbook data will drastically reduce the staff workload in responding to FOIA requests. View your data in graph or table view, filter by category, and drill down on specific content.